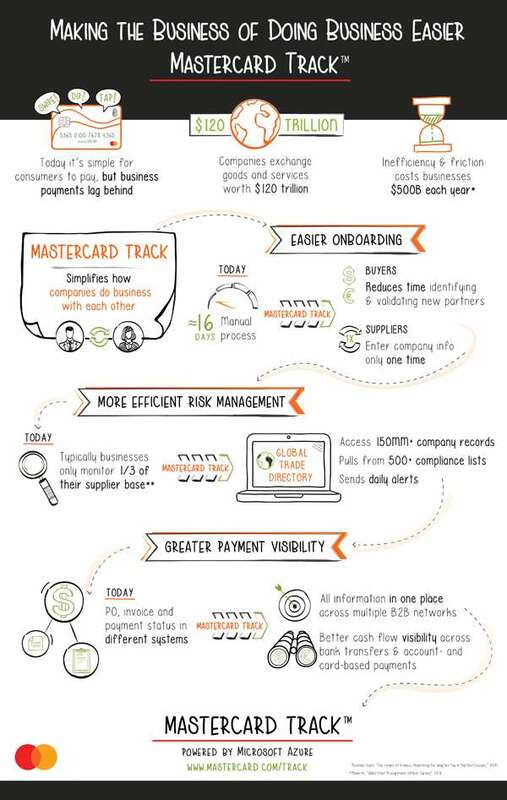 introduced Mastercard Track™in collaboration with Microsoft(NASDAQ: MSFT). Track is a unique global trade platform that will simplify and enhance how companies around the world do business with each other. While parts of the B2B process have been digitized, large and costly gaps still remain –an estimated $500 billionin annual administrative costs and rising .These costs are added to the inefficiency of the nearly half of all global business transactions – $58 trillion – that are still done in paper. While consumers have become accustomed toa broader choice of technology solutions, businesses too are looking for speed, security and convenience in their everyday operations.From reducing the steps it takes to identify a business partner,to making the payments process simpler and more transparent, Mastercard Track has the potential to unlock economic growth and to level the playing field for small- and medium-sized enterprises (SME). Initially, Mastercard is partnering with nineB2B networks and procure-to-pay solution providers –Basware, BirchStreet, Coupa, the Infor GT Nexus Commerce Network,Ivalua, Jaggaer, Liaison Technologies, Tradeshift and Tungsten Network – representing a wide range of global businesses, to roll out Track’s identity, compliance and paymentmanagement capabilities to buyers and suppliers. Beginning in early 2019, customers of these organizationswill be able to maintain, retrieve and exchange key information relating to themselves and their trading partners through the Track Trade Directory, a secure, permissioned repository of over 150 million company registrations worldwide.This central directory will integrate feeds from more than 4,500 compliance lists into one place, making the screening and onboarding of suppliers more efficient. In Singapore, Mastercard Track has already been integrated with the National Trade Platform, a one-stop digital trade eco system which brings together key logistics functions, such as movement of goods as well as regulatory and financial elements for players across the trade value chain. Mastercard Track facilitates secure and efficient electronic payments between buyers and suppliers, helping to strengthen the country’s position as the leading trading hub for the region.